Wes is obsessed with light switches. If you’re carrying him through the house and you pass a light switch, be prepared for him to reach out, hook his hands onto the door frame, and pull with all his might until you stop and let him turn the switches on and off for a while. Sometimes I’ll put a chair under the switches so he can have at it while I do something else. Wes is getting bigger and older. At his 2-year checkup last month he weighed in at about 21 pounds, which put in him in 0.96% for regular kids, and in the about 25% for DS kids. Smallish, in other words. I have to take him to get his blood drawn for another thyroid test (a common problem for people with DS) and next Friday I’ll take him to the cardiologist for an EKG and limited echocardiogram. Hoo-boy. So much fun. About 50% of people with DS are born with heart problems. I took Wes to the cardiologist in Nov. 2007 when he was just 7 or 8 weeks old. We learned then that Wes has Small Secundum ASD. It means that one of the valves in his heart that should have closed up at birth didnâ€™t. But the opening was a small one, and Dr. Mart said that often such openings will close by themselves in a couple of years. So that’s what I’m hoping we’ll find when I take him there next week. If not…surgery. I finally forced myself to pack up all his clothes that were size 3-12 months and only leave stuff in his closet that’s size 12 months or bigger. He was still wearing pants and onesies that were size 3-6 months. But I thought to myself, This kid is TWO. He should not be wearing stuff meant for infants. So, even though his clothes are baggier, at least they’re more age appropriate. He looks more like a boy with proper big boy clothes on. He fits best into pants that are size 12 months and he can wear shirts that are 12 or 18 months. Now that we have window well covers in our fenced-in backyard I’ll let Wes out there on nice days to play. He has a couple of balls that he likes to roll around and sometimes lose behind shrubbery. He also likes to pull the petals off my roses and yell at the cars that go by on the other side of the fence. John and I have learned that Wes picks up on much more than we usually realize. This past week I was listening to The Phantom of the Opera CD at home, and when the first song ended I looked over and saw that Wes was standing still, with his arms folded. Like he was ready for prayer. I had to think, why is he doing that? Then I remembered how in church we often sing first, and then pray (like at the start and end of our Sacrament meetings). Only two years old and already Wes knows about prayer. Our church is three hours long, and during the last two hours Wes normally goes to a nursery class with the other 18-month to 3-year-old kids. Last week he had a runny nose so we took him to the adult classes with us. By the last half hour of church Wes had had enough, so I took him on a walk in the hallway. 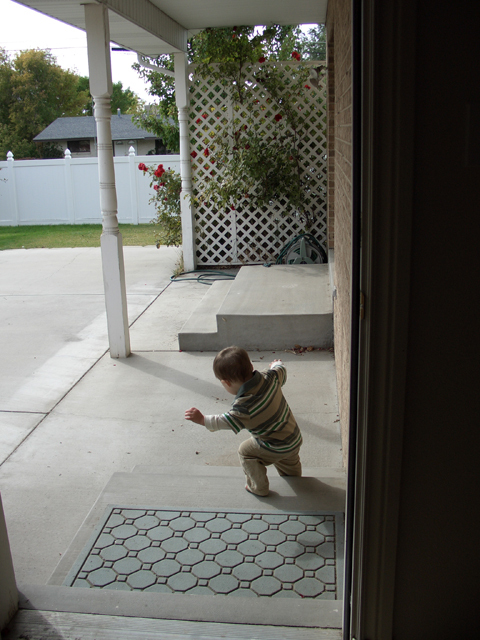 When we got near the door to the nursery Wes ran up to it and started tapping the door. I tried to pull him away so he wouldn’t disturb the class inside, but he looked up at me and urgently made his “more” sign. I was so surprised that he knew that his nursery class was on the other side of that door!